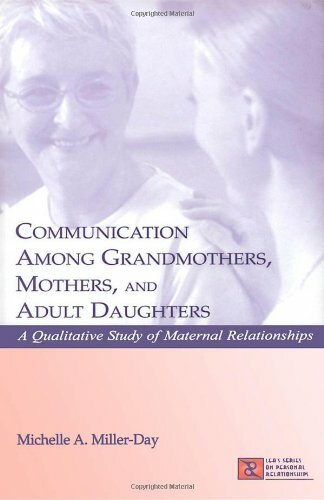 This volume examines communication processes within the grandmother-mother-daughter relationship, emphasizing an intergenerational perspective. Using observations of and extensive interviews with six sets of middle-income, Caucasian female family members, this book offers a heuristic account of intergenerational mother-daughter relational communication. Author Michelle Miller-Day integrates and juxtaposes alternative experiences of social interaction, situating readers in the world of grandmothers, mothers, adult daughters, and granddaughters as they experience, describe, and analyze their family communication. Miller-Day incorporates aged mothers and younger mid-life mothers and their adult daughters into the research to illustrate how this type of maternal relationship is experienced at different points in a woman's life. With the inclusion of three generations of women, Miller-Day offers multigenerational perspectives on family, and examines them for patterns of maternal interaction, providing symbolic links across generational boundaries. Communication Among Grandmothers, Mothers, and Adult Daughters enables readers to understand more completely the richly textured nature of maternal relationships. It will be an invaluable resource for scholars and researchers in the areas of communication and relationships, including family communication, intergenerational communication, women's studies, family studies, interpersonal communication, and relationships, as well as social workers, psychologists, and counselors, who strive to understand family communication processes and their dynamics across generational lines. View More In Parenting & Families.